The 4x4 tyre that is designed with off road in mind. The Dunlop Grandtrek AT2 is the perfect hybrid for use off road scoring highly in internal testing for off road performance and also scoring well against the EU tyre labelling noise emissions. 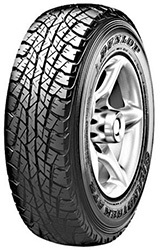 The Grandtrek AT2 also scores well and performs well in the wet making it a great all year round tyre. This special edition of the Grandtrek AT2 MO has been produced in partnership with Mercedes and they have given their approval for the Dunlop Grandtrek AT2 MO to be used as both original and replacement equipment on some of their models.